The Trinity Table is a passive motion table that rotates in a circular motion. It is designed to put the journeyer in a deep state of Alpha-Theta-Delta brain wave relaxation, quickly connecting you with the higher energy planes for personal transformation. The Trinity Table operates in conjunction with all cosmic Laws of the Universe, when used with your conscious intent, it serves to readily open you to your Divine source. In each journey, Spiritual Beings of Light focus energy and open a multi-dimensional connection with Universal Energy and Consciousness. In effect, a portal is created wherein unlimited possibilities exist for shifts to occur at all levels. 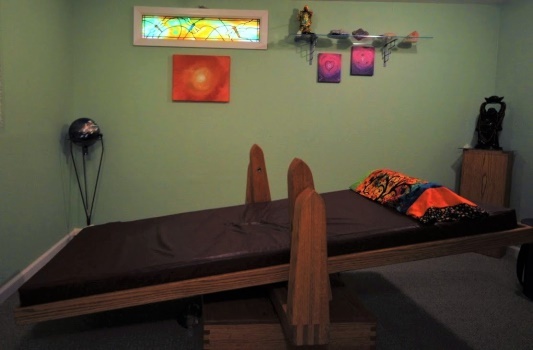 The Trinity Table is not a medical healing device; however, natural healing can be attained and normally accessed in only a few minutes during a deep state of being while on the table. This deep meditative state elevates and balances your energetic system. While some have experienced dreamlike or clairvoyant visions, past life review, and/or hear messages, others simply relax. Before entering the Sacred Space of the Trinity Room each person will receive a clearing and chakra balancing. During your journey, Berena Wise will be in the room and open her channel to see and hear what your Guides, Ascended Masters and Angels have to tell you. She will share any experiences and messages with you after your journey. You will receive a written transcript of your message. You may want to bring your own recording device. Appointments can be scheduled on Wednesday, Friday, Saturday and 1st Sunday. The Trinity Table was an amazing experience! My session started and within minutes, I was seeing many images flashing through. My experience was very similar to a quick slide show. Before I knew it, Berena was gently waking me to come out of the meditation. I had just finished my 30 minute meditation and it only seemed like a few minutes! Berena’s reading afterward was amazing and provided me with some great insights that I needed. I definitely recommend this experience. ~ B.G.